On its third trip to Landmarks, a scaled down, minimally visible addition fails to gain favor. 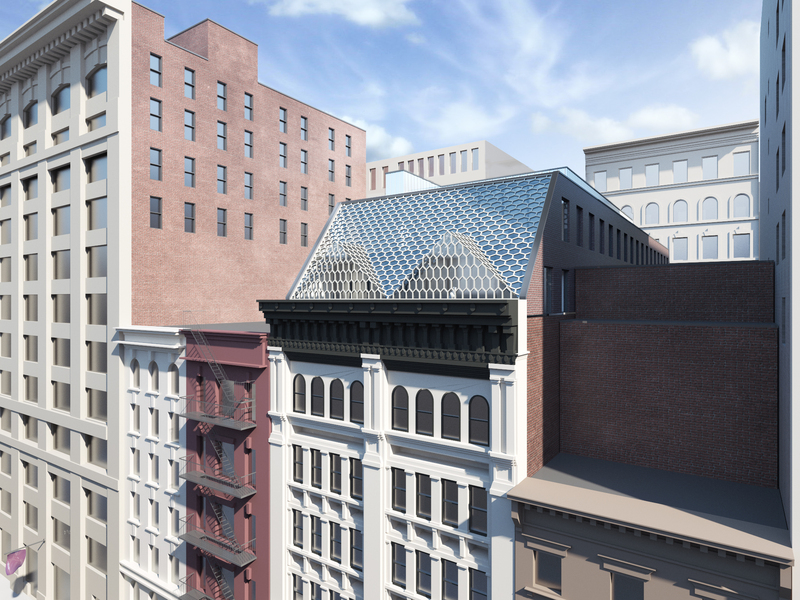 On September 14, 2010, Landmarks considered for a third time a proposed rooftop addition to a six-story building at 33 West 19th Street in the Ladies’ Mile Historic District. Landmarks had rejected two previous designs due to their size and visibility. 7 CityLand 60 (May 15, 2010). The owner first proposed a five-story addition that was set back behind layers of translucent mesh. The owner returned nine months later with a three-story perforated-metal addition that followed the form of the mansard roofs common to the district. At the September 14 hearing, architect Morris Adjmi presented a revised two-story design. The addition would only be partially visible from street level. The proposal still emulated the shape of a mansard roof and retained the previous iteration’s honeycombed glazed aluminum over glass and a terra-cotta cap. Adjmi noted that he simplified the design in response to the com missioner’s comments, but that it still served as “an abstract representation of a dormer.” The addition would be set back further from the existing building’s front facade so it would not compromise its cornice. Commissioner Stephen Byrns said he could support the proposal, but would have liked the design more if the peaked dormers were more visible and a bit taller. Commissioner Fred Bland said the building’s large cornice allowed a lot of latitude for an addition and expressed reluctant support for the proposal. Bland regretted that he would have to approve “a watered down, meek version” of what had previously been presented. He said “sometimes great architecture simply is appropriate,” and was disappointed that “infinitesimal visibility has become the watchdog” for what is considered appropriate in a historic district. Vice Chair Pablo Vengoechea said it was “unfortunate” for Landmarks to reduce the capacity for exciting design and innovation, and urged the owner to revise the design in the direction of the previously proposed plan. Commissioner Roberta Brandes Gratz, who had opposed the previous designs, concluded that sometimes Landmarks should be more flexible in the service of good design and that a more visible addition could be appropriate for the site. Commissioner Libby Ryan maintained that a two-story addition would substantially impact the bulk and mass of the mid-block building. LPC: 33 West 19th St., Manhattan (09- 7994) (Sept. 14, 2010) (Architects: Morris Adjmi Architects).